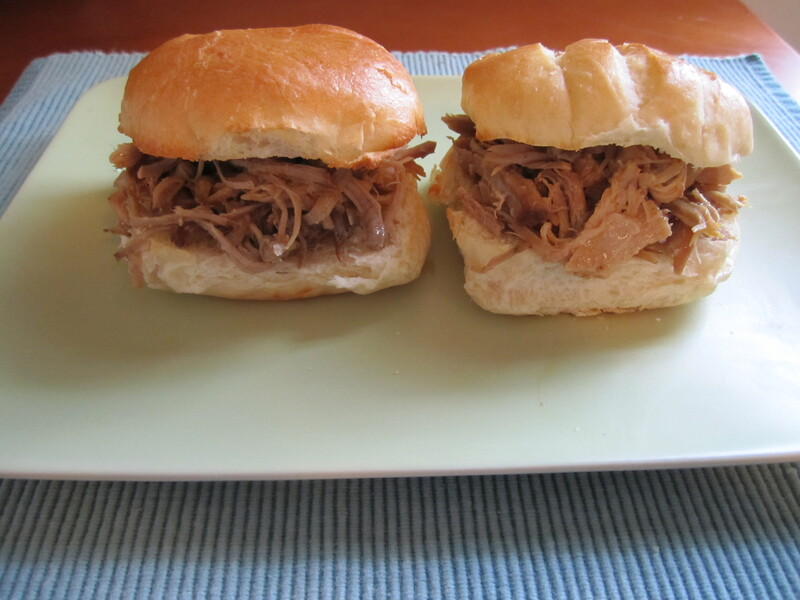 Pulled Pork Sandwiches - Eat. Drink. Love. Have you ever had one of those weeks where everything you cook is just…blah? Yeah, that’s me this week. I made more homemade pizza on Sunday and I wasn’t happy with the way the dough came out. I made teriyaki salmon last night and wasn’t happy with that dish either. Well, tonight’s dinner got me out of the dinner rut. Can I just say how much I love the crock-pot? It is perfect for busy moms, dads, and of course, grad students on the go! My friend, Raquel, gave me one as a wedding gift last year and I can’t believe I have gone so long without having one! So far, the only recipes I’ve really used it for are pot roasts and tomato sauce. I’ve been wanting to attempt pulled pork sandwiches, so I hit up my beloved AllRecipes.com and went through many of the pulled pork recipes that were there. I ended up making up my own recipe by taking bits of multiple recipes based on what ingredients I had in my pantry. This pork was tender and moist! It was so good that my husband had 3 sandwiches. Serve these sandwiches with some roasted or mashed potatoes and a big salad and you’ve got yourself a mighty fine dinner! 1.Turn crock-pot on low heat. Slice onion into thin slices and place at the bottom of the crock-pot. Rinse pork and pat dry. Combine salt and pepper, paprika, and brown sugar. Rub mixture all over the pork and place into the crock-pot. 2. Combine cider, Worcestershire sauce, mustard, and red pepper flakes. Drizzle mixture over the pork. Cook on low heat for approximately 10-12 hours. 2. Remove pork from crock-pot onto a large cutting board (scoop out onions if you want to eat them). Drain liquid or pour into a sauce pan if you plan to make a gravy. 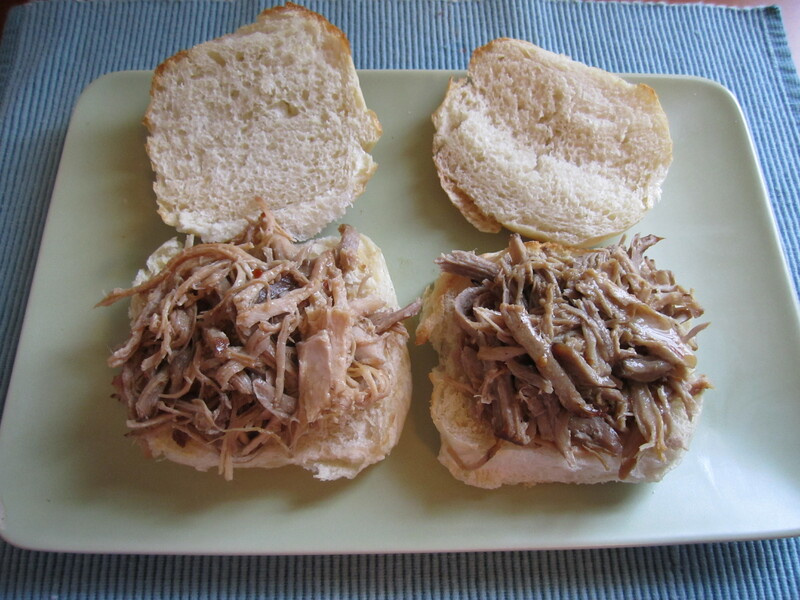 Using a fork, shred pork and serve on toasted buns with homemade gravy or your favorite BBQ sauce! – I made my own gravy using all of the liquid from the crock-pot. To make your own gravy, pour the liquid into a sauce pan. Using a mesh skimmer, skim off fat from the top layer. Add 2 Tbs. of flour and heat mixture, stirring constantly until four is well-combined and cooked. Then add 1 cup milk, and 1 cup of water or additional milk. Keep stirring and bring gravy to a boil. Serve immediately. a good pork sandwich can head this way anytime! we have a local place that we love to go to that serves BBQ pork sandwiches, but I need to start making them at home!